Cartridge rib: So forgiving and unforgiving all at the same time. Row 1 : Knit 3, purl 1. 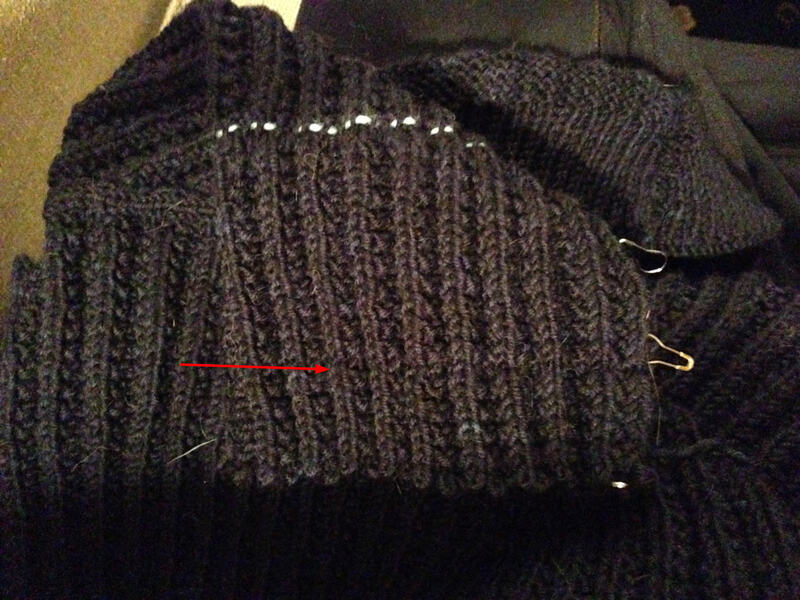 Repeat these stitches to the last stitch in the row, then knit 1. Row 1: Knit 2, (purl 1, knit 3)*; repeat stitches in parentheses to last two stitches, then purl 1, knit 1. Row 2: Knit 1, purl 3. Repeat these stitches to the end. There’s a very popular variation to cartridge rib that involves slipping some stitches instead of purling. Cartridge rib stitch pattern. Image from purlbee.com I think this sample includes the slipped stitch variation. Why all this detail on cartridge rib? It’s so I can properly describe the mistake I’ve made on the Svalbard cardigan. You see that horizontal line? That’s what happens with cartridge rib when you get a little bit off on the pattern and accidentally repeat a row twice instead of alternating. This would be hard to do when knitting flat. But when knitting in the round (for a sleeve) it’s very easy to do. All it takes is a repeat of Row 2 (Knit 1, purl 3). The right side won’t look obviously wrong–all the stockinette Vs and purl bumps will appear to be in reasonable places. But something will be just a little off in the knitting. And if you make the mistake of NOT looking at the wrong side of your work and continuing on, what you will get is a little horizontal trench in your work. You can’t ignore that little trench. You can’t block it out with water. It’s there and it is so distracting. Nothing around it can look good while it is present. Cartridge rib can be so unforgiving of mistakes that are made consistently; however, it can be very forgiving of mistakes made randomly. So long as your random mistakes don’t interrupt the vertical stockinette ridges in the fabric, they tend to get lost. The wrong side of cartridge rib, particularly along sleeve decreases, can hide a multitude of sins. Don’t look at the wrong side of my sleeves. Just don’t. Next Communal Knitting Project – A New Holiday Tradition? Wrong sides are called “private sides” for a reason, right? 😉 I’ve never heard of cartridge rib – looks cozy! It is cozy. I remember I knitted my first “fancy” ribbed scarf using this stitch. I wonder if anybody has ever done a “private” side confessional. You know, the front may look nice, but there are dark and terrible things hidden on the back. Q – What a lovely stitch! One I’ll have to try. That brown yarn is scrumptious. Dang mistakes! An interesting texture I’m definitely going to have to try out, thanks. In a recent pair of socks I’ve been knitting, I included scraps of indigo dyed, hand spun than I almost threw out (due to gnawing mice) . With the lye needed, I’m not likely to repeat this dye process. It was special, done over an open fire when I worked at a historical park. I washed and salvaged only some of in hopes of felting. The color blended so well with the variegated sock yarn. I decided to knot the ends together, popping them to the back like little beads which allowed for two small stripes on each sock. The handspun is thinner than the rest of the sock yarn, so the knots aren’t annoying. But yes, don’t look at the inside. Hah. I’m glad you found a solution that would let you to continue to use some I the yarn.